Natural Touch Small Calla Lily Bundle of 9! MANY COLORS! A Natural Touch Bouquet 6 pcs of Natural Touch FLOATING Plumerias. 3" Wide. Very realistic flower! Choose between Off White, Pink or Tropical Punch. These plumerias come packed flat ready for shipping. They are wired so they can easily be opened and shaped. Ships within 2 to 3 weeks. May be sooner according to availability. Amazing Natural Touch/Floramatique Small Calla Lily Bundle. A Beautiful bundle of 9 Floramatique Calla Lilies in your choice of Colors. The Flower Head is 2 1/2" Wide x 3" Tall. 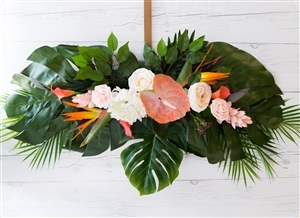 Real Touch Tropical Plumerias Flower Mix Garland - YOUR Colors!